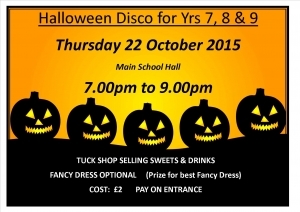 There will be a Halloween Disco in the main school hall on Thursday 22 october 2015. Tuck shop will be available selling various sweets and drinks. Fancy Dress optional but there are prizes for the best!! Cost is only £2 which you pay at the door. Remember to arrange, and know, who is collecting you at the end of the evening.